During the week of 6 November, Edgo’s group managing director, Omar M. Masri, held high level meetings in Tripoli and Benghazi with the chairmen and senior management teams of the various operating companies as well as the National Oil Company. As the security and political situation begins to improve in Libya, the Edgo group has been ramping up activities in Libya across its various subsidiary companies and activities, including Tripoli’s Edgo Services Center, Camco Oilfield Services, ESP Ltd., Gunny Oilfield Services, and Mina International. 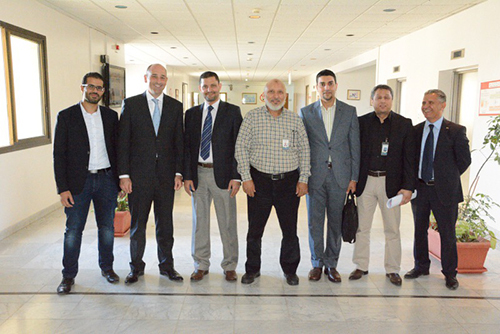 Accompanied by Ibrahim Entira, operations manager of ESP Ltd., Mohamed Lenghi, Applications and Technical Sales Engineer of ESP Ltd, and Ahmed Mughrabi, Camco Oilfield Services sales manager, Omar met with the Libyan operating companies to discuss the outlook in 2018 and associated opportunities. Building on a 31 year heritage in Libya, Omar reiterated Edgo’s commitment to Libya’s oil & gas sector, and the group’s intention to support the operating companies with industry-leading technology solutions and quality after-market support through its in-country network of camps, workshops, and experienced technical teams. Edgo has partnered with leading global oil & gas companies, including Baker Hughes, a GE company (BHGE), and will be offering a wider suite of oilfield services and technology to the Libyan market, including Centrilift electrical submersible pumps and other oilfield services. Before leaving Libya, Omar hosted a dinner for our Libya team at the Barracuda beachfront restaurant in Tripoli.